So, I've been living out of a suitcase for eight days now, staying at three different houses in three different states. Of course I feel very fortunate to have been able to take a 10-day vacation full of stops to see family and friends. But I'm starting to miss my house and my pets! We've had a lot of fun so far, with many adventures along the way. For most of the week, we've been with our best friends and their kids, combining two families of four into a chaotic group of eight. At the beginning of the week, my girlfriend stumbled across an article in the Huffington Post that had us all rolling with laughter: Vacation or Trip? A Helpful Guide for Parents. We had to all agree we were, most definitely, on a "trip". 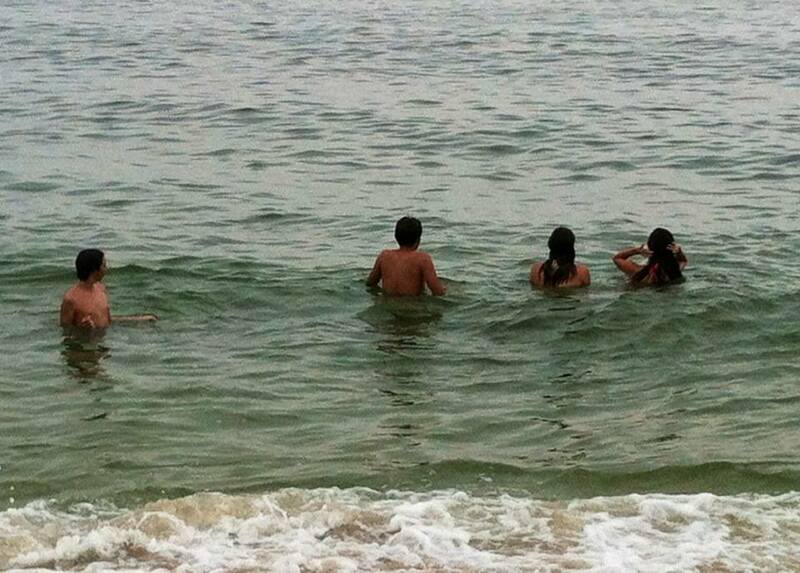 The kids in the ocean at Bethany. trying to beat the heat. But it's been a trip full of adventures, and long drives, with plenty of family memories forming along the way. 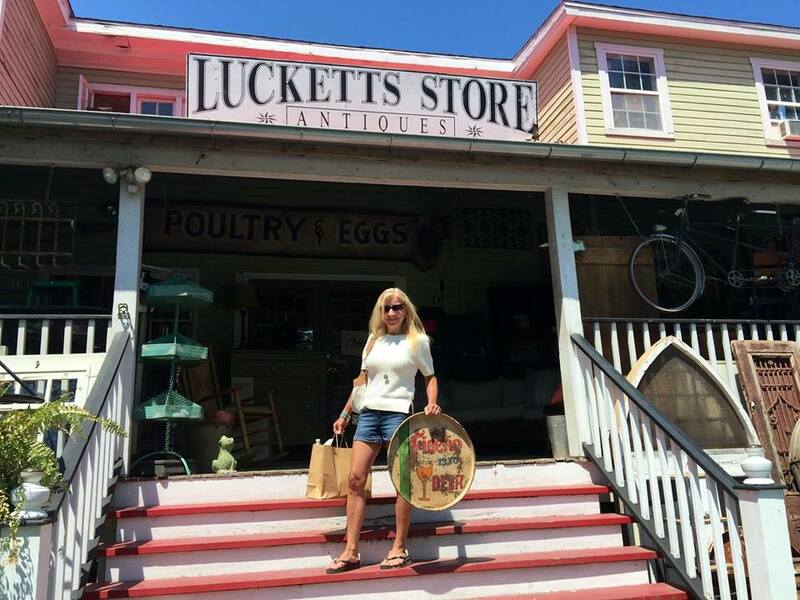 We began Sunday evening in Bethany Beach, Delaware, a beautiful town with a great book store that hosts me for annual book signings. We stayed over on the bay side, packing our eight, one friend, and one dog into the house. The weather was sunny and very HOT...a heat index of 104 degrees one day. That was, of course, the day the air conditioning broke. So our trip to take the kids to the Rehoboth Boardwalk was delayed one day, due to an emergency repair on the AC, but we did get them there, returning home with a ton of candy and cheap prizes from the arcade games. In a strange coincidence, my younger son woke up the next day with a very upset stomach and threw up all morning. Thankfully, it was not a stomach bug that traveled through the group! He was on the mend by the time we arrived Wed. afternoon in Leesburg, Virginia, the beautiful hometown of our friends. Aside from enjoying the pool and restaurants, we went into wine country to antique one day. Oh, and we decided a visit to Harper's Ferry, West Virginia, would be a good opportunity to try our hand at white water tubing. We should have learned our lesson after our previous visit to the same area for what's now known as the "Zip Lining Disaster of 2013". All I can say is it's nearly impossible to keep eight people together without ropes, which are not permitted, on a river with strong currents and a mind of its own. There was some panicked moments of missing the correct path, some frustrated moments of getting stuck, and a lot of hilarious moments involving trying to get back into tubes we'd abandoned after one of those panicked or frustrated moments. I'm looking to grow my new Street Team! What's a Street Team, you ask? I had no idea either, but almost all of the authors at my agency have one, and my agent suggested I give it a try too. Basically, it's a group of people who want to help promote your books via social media. They could be fans of the author's books, fans of romance and suspense in general who want to try your books, avid readers of all genres who want to join the community, or people who just want to make new friends and help out. There are rewards to joining, of course! First off, you can request an ecopy of one of my books for FREE. Secondly, I do a prize drawing once or twice a month - usually a gift card, but sometimes jewelry or other physical prizes. 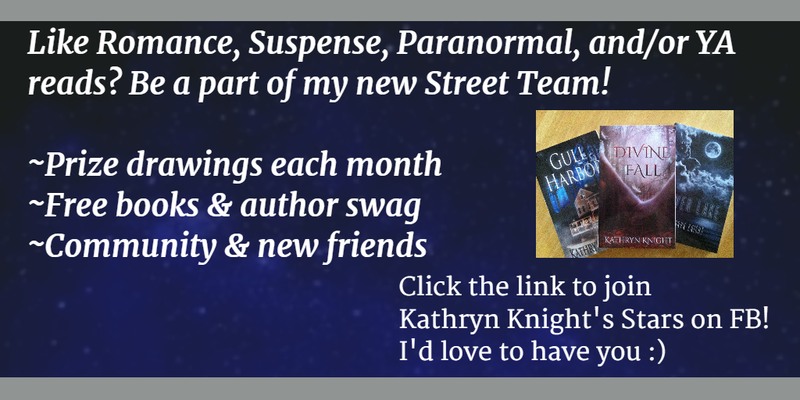 Plus, you meet new friends, help an author increase visibility, and get inside info into the publishing process and upcoming releases (like Haunted Souls!). What's required? Not a lot! Participation is as much or as little as you want - all are welcome, regardless of activity level. So the only actual requirement is a FaceBook account, as that is where we organize. Typically, once a week I'll post a FB share or a Twitter tweet and ask for shares or retweets if willing or able. Anyone who shares/RTs comments "Done" and gets added to that month's prize pool. This past month, one lucky member received a $20 gift card to Amazon. So, I'd love to have you! This is a Closed Group, so only members can see what is going on. Just click the FaceBook link below, hit Join, and I'll add you. I have many fellow authors in the group, so both readers and writers will have a chance to meet new authors. I look forward to meeting new members! A fabulous new author interview went live today on Britbear's Book Reviews site...she had some really great and unique questions for me. 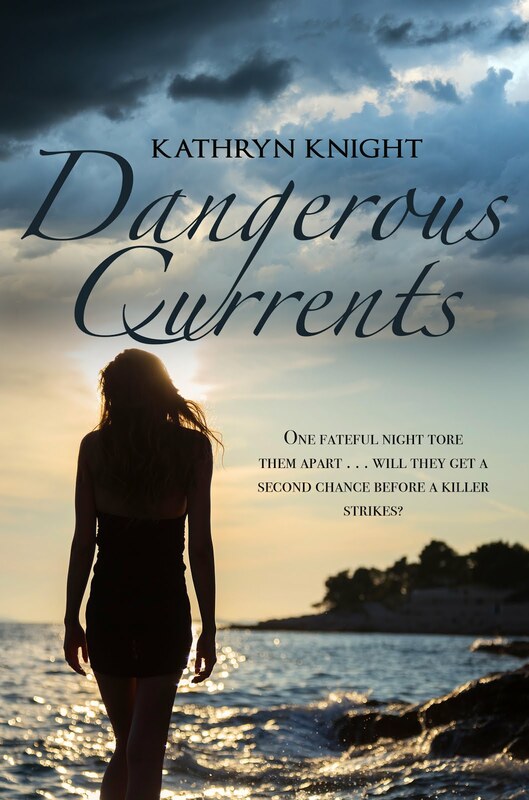 Check out the post here: Interview with author Kathryn Knight. And don't be surprised if you have a sudden craving for gummy bears afterwards! 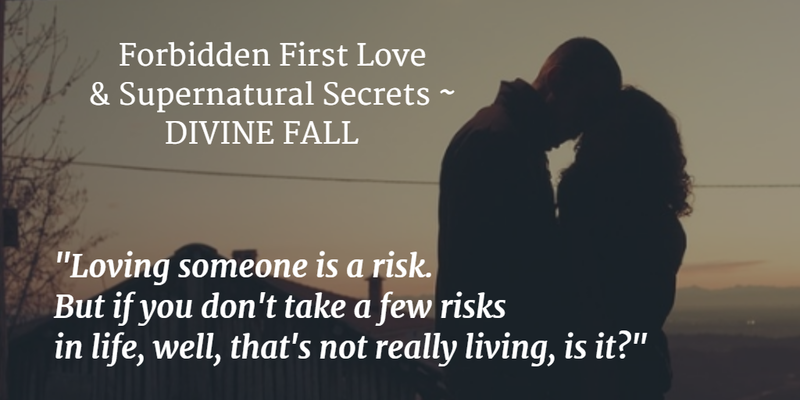 First Love - only 99c! Last week I received an email from The Kindle Book Reviews with a link announcing the first round of books to move on - the Semi-Finalists. Only 20 books per category were chosen, so that's fairly stiff competition. 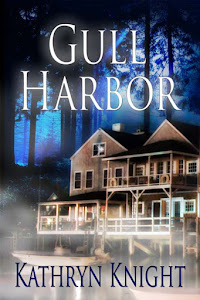 But my ghost story/romance GULL HARBOR made it last year to the Semi-Finals, in the very crowded "Romance" category, so I held my breath and clicked. DIVINE FALL was there! 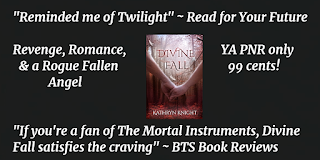 This is a YA book, so regardless of the romantic and paranormal elements, it fits into the "Young Adult" category in this contest - another large category with all sorts of sub-genres. I've really struggled with this book in a few ways, so I was over the moon. 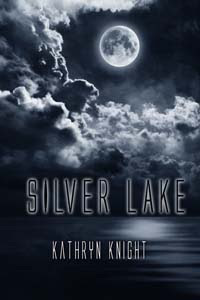 My first two books are steamy romances mixed with suspenseful ghost mysteries, but after writing SILVER LAKE and GULL HARBOR, I felt like doing something a bit different. I had an idea for a YA novel involving the last Nephilim, the half-angels, half-humans from the Book of Genesis. And the main character, 16-year-old Jamie, was going to tell the story through deep first person point-of-view. She was also going to love riding horses and spend all her time at the barn--a nod to my own childhood passions. 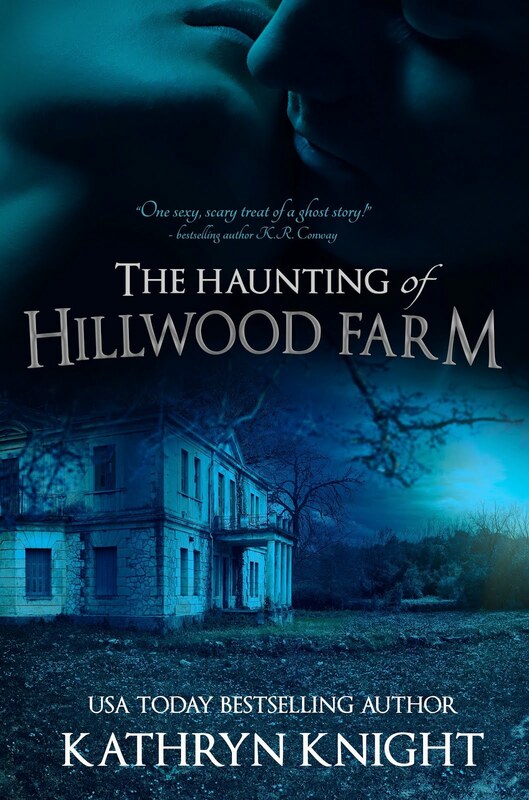 By the time I finished this manuscript, though, the Paranormal Romance market was absolutely saturated. Young Adult books involving angels in particular. Publishers just weren't looking to acquire anything in this glutted genre, and my current publisher did not have a Young Adult line. But my fans were waiting for my latest release, and it was ready to go...so I decided to use all the knowledge I've gathered in the years I've been in the writing business and publish this one on my own. Yes, it was scary to not have the backing of a publisher. Not to mention, all the marketing and promotion would be solely on me. 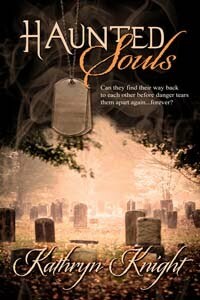 But there are some perks of publishing independently, and designing your own cover art is one of them. I had so much fun designing Divine Fall's cover with the artists I chose! 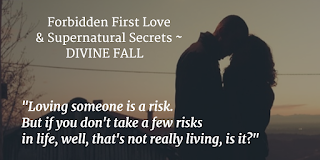 My regular readers were certainly ready to take the plunge into YA with me, but in terms of marketing, I'm not as adept at connecting with a younger readership. So it's been stressful trying to figure that part out. Given these struggles, the fact that Divine Fall made the first cut in the Kindle Awards for YA really boosts my spirits! I'm keeping my fingers crossed we'll move onto the Finals. 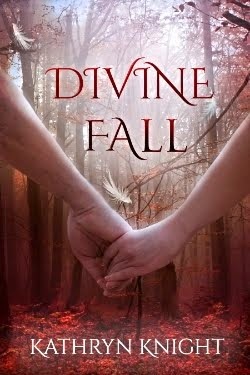 I'm also encouraged by the fact that Divine Fall was one of only five books to make the Finals in the YA RomCon Reader's Crown Award, and that this book is also currently up for the Red Carpet Awards at BTS Book Reviews--a fantastic review in their magazine secured Divine Fall an entry! Happy 4th of July weekend! 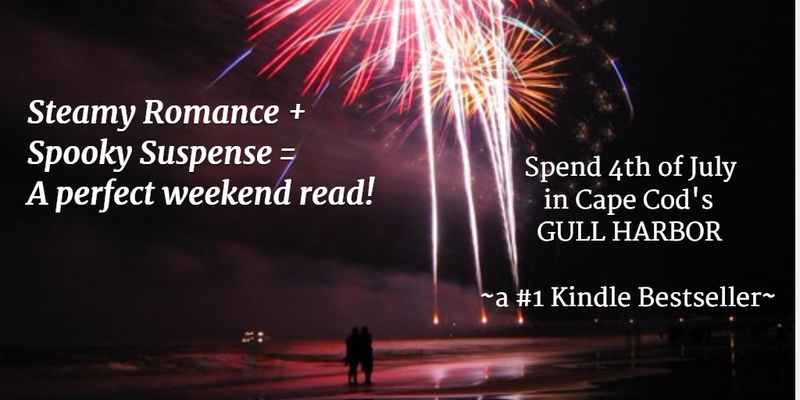 Here on Cape Cod, the summer season officially kicks off this weekend, and things get a bit hectic! As usual, we have a house full of guests, and plans for the beach, cookouts, and fireworks. And while on the beach, I'll be doing my favorite thing - reading! 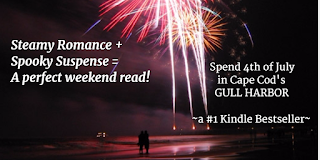 If you need a great page-turning beach read for the holiday, try GULL HARBOR - a spooky ghost mystery mixed with steamy second-chance romance, set here on Cape Cod's National Seashore. A flood of heat that had little to do with the warm July sun surged through her. How was it that this man aroused her so? She could feel the sexual tension between them, thick and heady. “I’d love that,” she said softly, dipping her head down to hide her flushed cheeks.